One of the things the male Dawn Jogger introduced the female DJ to on their honeymoon in 1981 was the English breakfast. This was even though he most remembered cold spaghetti from his days at Taunton School in Somerset. So, at Heathrow in plenty of time for her flight home, the female DJ nipped into a cafe for a sentimental food journey back 30 years. She did not remember the gigantic proportions. She was reminded of the saltiness and greasiness. Let’s just say some tastes are better remembered in the mind and not the mouth.. This entry was posted in Middle widow, On the road and tagged English breakfast. Bookmark the permalink. 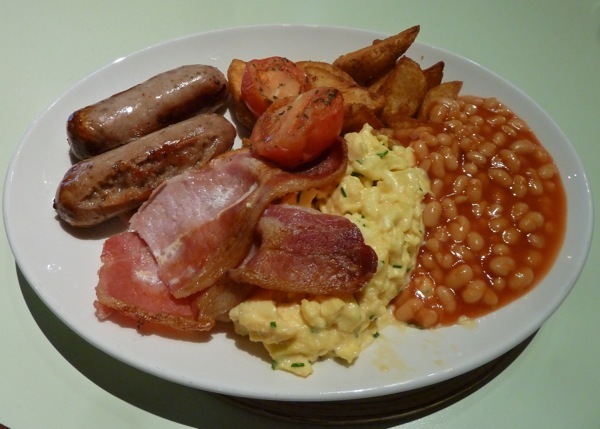 I love English breakfasts and I think, even this one, looks really yummy! Now that is a REAL breakfast, I hope you ate it all up !